Auto Fidelity Group is a group of independent shops takes pride in being the best at taking care of todays cars that have been damaged in collisions or vandalized and need the electronics and their related parts serviced or replaced. Our reputation is built on caring about our customers, being honest, and providing quality service. Even though we specialize in servicing auto collision repair centers we are often found aiding small shops or major dealerships with our expertise. All our technicians are certified and continually undergo training to keep up with today's technology. Professionalism is something we don't compromise on, as it is a sign that we care about what we do, and it shows. A good deal of our business comes from customer referrals, for which we are thankful. Nothing is better than having one of our customers praise our work - it lets us know we're doing a good job. Call on us for all your vehicle maintenance services, and you won't ever need to use another service like ours again. Since opening in 1989,, we have worked to provide the most outstanding automotive services possible. 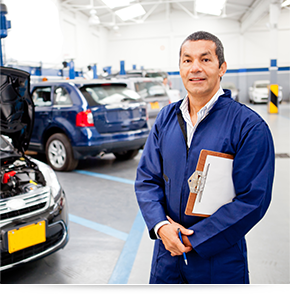 Our mission, as technicians, is to make repairing your vehicle simple, convenient . A lot of auto care centers and technicians say they go the extra mile and will do what it takes to keep you happy and safe. Our team actually puts that into practice. This is a mobile service in that we come to your shop and complete the neccessary service on site. You won't find a more dedicated, honest, or reliable service than the members of Auto Fidelity Group. "I had a real headache of a job in my shop and it seemed no-one could figure out the reason the backup sensors didnt work plus I had various trouble lights on the dash. Gary was sent to my shop and in a short time reset the lights and found the problem with the backup sensors.- Mitch B. "The guys at Auto Fidelity Group are the wizards of auto electrics. They figured out the problem, explained what we needed to finish the job and then came back out and programmed the control module we had to replace." - Darren M.
Auto Fidelity Group makes certain to back up our work. All repairs come with a full 120-day labor warranty, We are a service provider only and aid you in sourcing your parts so you can get the right parts. We make sure that parts you use meet all safety standards. Our wiring harness repairs will meet or exceed industry standards. Repair of SRS wiring is done in accordance to each manufacturers standards. In some cases wiring harness replacement is required.